Tarkin is one of my favorite side characters from the films and tv show, because I’ve always admired his outright sassiness and disdain for everyone around him…including the people who could kill him in a second. So I didn’t hesitate to jump into this one because I wanted to know what makes the man tick. 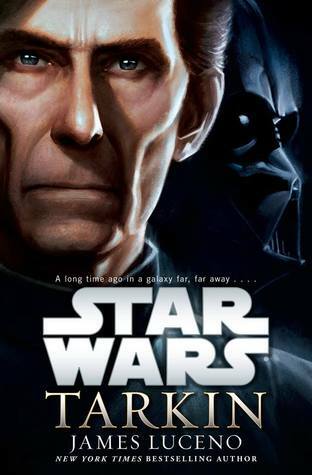 Unlike a few of the other new Star Wars novels Tarkin has a more deliberate and slower pace to it because it doesn’t relay on a ton of fast paced moments where the tension is thick enough to cut through. Instead this reads more like a short biography and not necessairly in a bad way. We do get to know who Tarkin is as a person and why he behaves the way he does. The calm demeanor and the scathing replies come naturally to him because of everything he’s been through to get to where he was before he died in the movies. I can’t even begin to tell you how utterly badass this man is. His childhood was definitely different and I loved getting to see how those tests his father put him through turned him into a man who can be strategic and get into the head of his enemy even under the worst of circumstances. The main focus of the book centers around Tarkin and Vader as they worked to take care of a group of rebels who have been harassing them, and I really liked how it really fleshed out the tenuous but respected relationship between these two men. There is a grudging respect there that you don’t really get to see in A New Hope because of the amount of glaring that occurs. It also connects into the Clone Wars tv show to help flesh out why there is still some tension between them. I can’t say I’m a huge fan of Luceno’s writing. I’ve tried reading one other book by him before and it was really bogged down by politics and excess descriptions, and in some cases this book has some of those same flaws…but I think he managed to offset it well with the constant movement of the rebel plot. I think given who the main character of this book is the slower pace definitely makes sense, but it did take me a little longer to get through because of it. Overall it’s a solid book with some great details. I wouldn’t call this a must read for those wanting to know major plot points they may have missed, but if you enjoy Tarkin or really like getting inside the heads of the villains in the series then it’s certainly worth checking out. Image | This entry was posted in Book Reviews (2015) and tagged 3.5 Stars, review, sci-fi. Bookmark the permalink.